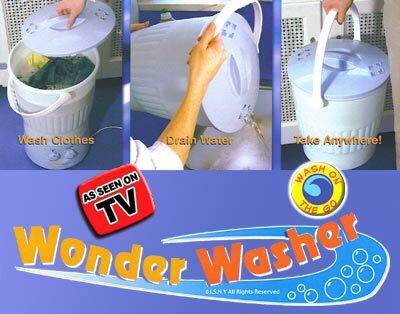 Wonder Washer Handy Helpers - Buy It Now! Wash Clothes, Drain Water, Take Anywhere: Portable Washing Machine Goes Anywhere: Perfect for Seniors, College Students, Boating and RV's. Fill with laundry, add soap and water and close lid. Specially designed drain holes in lid allow water and soap to drain without removing laundry. Wonder washer has a 7-liter capacity. Quiet motor. 18 1 / 2" x 12 1 / 2" x 12 1 / 2"